SeeMore Putter Company 30 second "Hide the Red Dot". 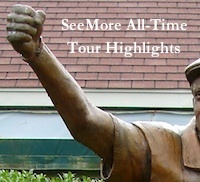 Visit SeeMore.com for more information on putters, putting tips and putting instruction. SeeMore Putters offer golfers the #1 alignment putting system in golf. SeeMore’s patented RifleScope Technology (RST), known by a visible gun sight on the top line, allows the golfer to set up the putter perfectly each and every time in relation to the intended target line. Click HERE to SeeMore!